When you treat yourself to a manicure at your favorite nail salon, you want to make it last as long as possible. Below, you’ll find some tips on how to make your manicure stretch further before chipping or peeling. Keep reading to find out more! Certain types of manicures will last longer than others. Additionally, some nail polishes even claim to last longer than others. All of this will factor into the total amount of time your manicure lasts without chipping, peeling, or cracking. Starting off on the right foot by choosing a longer-lasting manicure will ensure your nails continue looking amazing for longer. If you get manicures regularly, this might not apply to you. However, for those who either keep their nails natural or maybe swipe on a quick coat of paint at home, there are a few things you can do in preparation for a manicure that will ensure it lasts as long as possible. Keep your cuticles healthy. Ragged or overgrown cuticles can affect the longevity of polish or powder by not allowing a clean, uniform base for the polish to adhere to. Keep cuticles healthy by keeping your hands moisturized and using a cuticle cream or oil. Get your vitamins and nutrients. Strong, smooth nails are the key to creating a great canvas for your manicure. Ensure you are eating a balanced diet and, if needed, take nail-healthy vitamin and mineral supplements like biotin, folate, iron, and omega-3 fatty acids. While a manicure might appear to be dry, the layers underneath the top coat might remain pliable for up to a day after your manicure. We’ve all accidentally smudged a manicure we could have sworn was dry! For the day after you get your nails done, be extra careful not to dent or smudge your manicure. After that, be aware of your nails when doing things like cleaning, typing, yard work, and so on. Everything from dish soap to hand sanitizer can slowly remove the top layer of your manicure. Use gentle products, wear gloves while doing dishes or cleaning, and skip the hand sanitizer in favor of a mild hand soap. The topcoat is there to protect the beautiful polish underneath. The topcoat wears down as it comes into contact with harsh chemicals mentioned above, or even from friction caused by your clothing, bed sheets, and washing your hair. To ensure your manicure lasts, apply your own topcoat to the nail every other day or so. Be sure to apply this clear polish to the edges of your nail as well to prevent chipping or peeling at the edges. When you choose a nail salon that uses high-quality products and whose technicians are dedicated to using the best practices, you can count on your manicure lasting longer. 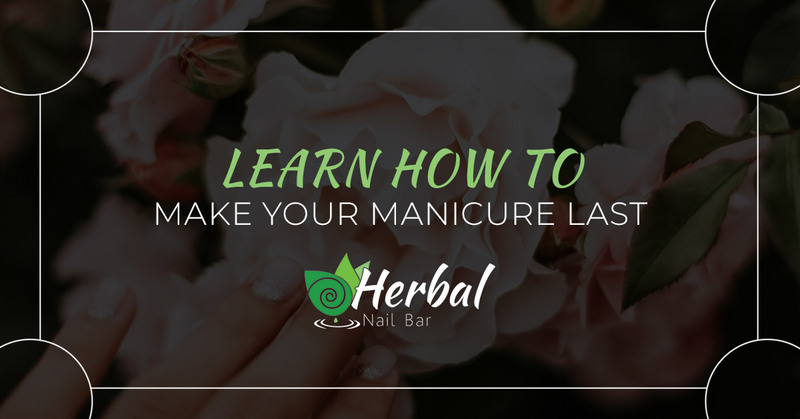 At Herbal Nail Bar in Naples, Florida, we take steps to ensure not only that you have an amazing experience in our clean nail salon, but also that you continue to love your nails for weeks afterward. Discover the difference that a top-quality nail salon makes when you stop by our organic nail bar in Naples. Book an appointment today!